Lufthansa's Boeing 747-8 jets feature on the German airline's key routes to Asia (including Hong Kong, Seoul and Tokyo) and the United States, including Los Angeles and New York to Frankfurt. With up to 92 business class seats to choose from on any given flight – spanning both the main deck and the jumbo's iconic upper deck – the seat you select can have a big impact on your journey, so if you're planning to step aboard the 'new jumbo', here are our top business class seating picks, along with a few seats you might prefer to avoid. 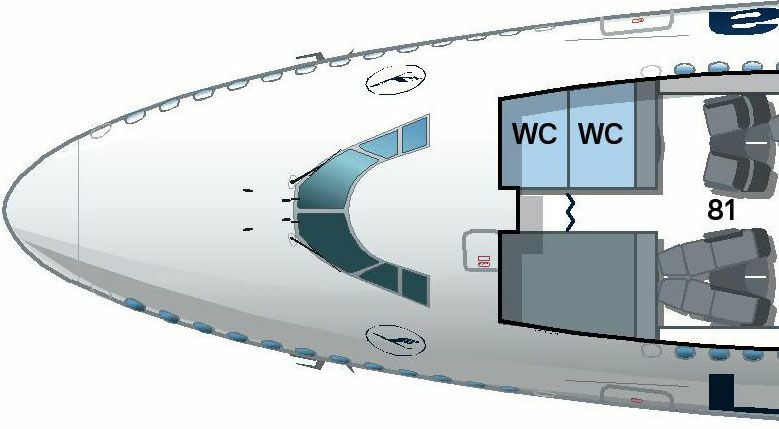 Your Lufthansa Boeing 747-8 flight will have one of two seating layouts in business class. It's not that there are two different types of business class seats, rather, one layout simply has more of those seats than the other, which are spread across both the main and upper decks. ... while on the main deck, the seating comes in a 2-2-2 layout instead, given the wider cabin and second aisle. 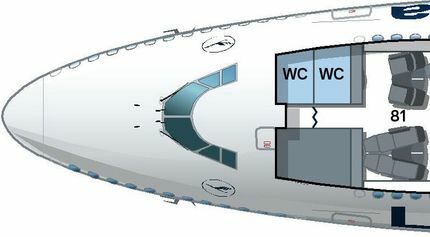 The easiest way to see which aircraft type you'll be flying on is to look for rows 12 and 14 when choosing your business class seat: if you can see these rows, you're flying in the 'bigger' business class cabin – and if business class instead ends at row 11, you'll be flying in the 'smaller' business class cabin. For work and sleep, the main deck's D/G seats: In a layout like this, your best bet for an uninterrupted place to be productive or to catch up on rest is to select a seat in one of the centre groups on the main deck. These are the only business class seats on the entire aircraft that don't require you to step over somebody to access the aisle or to be stepped over yourself, as passengers in the 'D' seats exit to one aisle, and those in the 'G' seats use the other. For that private jet feeling, row 81 upstairs: Before you panic, you haven't been downgraded! 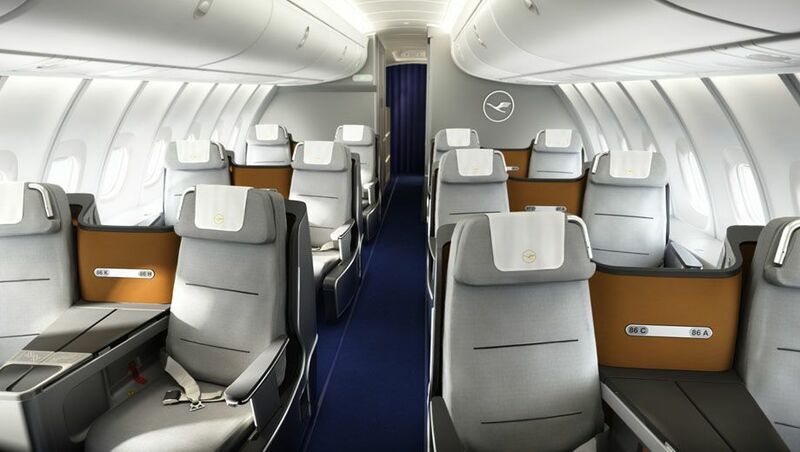 On Lufthansa, business class is numbered as rows 4-11 or 4-14 on the main deck, and then rows 81-88 upstairs, with row 81 the pick of the bunch. Facing forwards at the front of the cabin, the only time other passengers will pass by your seat is to visit the restroom – and even then, there's another at the back of the upper deck that many will use instead – and given the choice between an aisle or a window, I'd recommend the window for the view and the added privacy, even though you're not next to the aisle. For extra storage, the A/K seats upstairs: Adding to the appeal of the upper deck, passengers taking the A and K seats get more storage space than those in the aisle, thanks to the presence of storage bins directly below the windows. I find these are great for mid-sized items like laptop bags – which avoids disturbing your neighbour as your items are already right next to you – as well as housing items like blankets, pillows and amenity kits when not in use. As an added bonus, the lids on these side lockers double to provide even more usable space during the flight, which is why seats 81A and 81K are my first choice on these jets, even if a centre seat is available downstairs. For light sleepers, row 83 upstairs: For those who aren't great sleepers on planes and tend to wake easily, choosing a seat towards the centre of the cabin is usually a good place to start, as you're as far away as you can get from the usual sources of noise and light, but here on the Lufthansa Boeing 747-8, row 83 has an extra advantage. Because of the emergency exit doors behind, there are no seats directly after this row – row 84 is further back – and along with being just that little bit further away from other passengers, it also means that there's no entertainment screen mounted to the same shell as your seat, as can be bothersome if the passenger behind keeps tapping at their monitor, as I've experienced on countless flights. Although your seating choices are rather standard everywhere else in the cabin, there are a few places we'd suggest avoiding unless they're your only option. Seats near the galleys and restrooms: On both aircraft, this list includes 4A/C/H/K, all of row 9, 10A/C/H/K, 81H/K and 88H/K – although for those upper deck seats, their other benefits may outweigh the negatives of their location. On jets with the 'larger' business class cabin, you can also add 14C/D/G/H to that list, which back onto economy lavatories. Rows 12 and 14, in general: Because Lufthansa's Boeing 747-8s adopt those two different seating layouts, rows 12 and 14 don't appear on every jet, and it's not uncommon for aircraft to be swapped at the last minute for a variety of reasons. As such, if you've carefully selected your preferred place in row 12 or 14 and your flight is swapped for that 'other' type of business class jet, you'll lose your seat and will be reassigned elsewhere based on whatever is left over: losing any advantage of your pre-selection. It also means that your own seat will need to be returned upright before you even have a chance of stepping out, because there's very little foot space in between two fully-reclined beds. 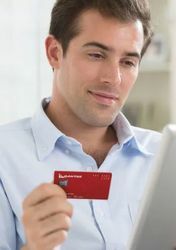 Chris Chamberlin travelled as a guest of Star Alliance and Lufthansa. Hi Chris. How’d you find the bed comfort and also the small footwell section when outstretched for a snooze? Hi JKH, both are covered in the review from JFK to Frankfurt. Not sure about their 747-8 but I did this on their A380 and I assume the seat is the same size. Footwell isn’t really that small and I was able to get a decent sleep rom FRA-SIN. I actually found it more comfortable for sleep than the new J on SQ. I started working in travel in 1999 and they haven’t flown here at all in my time... they used to but I don’t know when they stopped. Nope. BA is the only European airline still flying to Australia. Lufthansa stopped in 1995! See here for all Euro airlines "life" flying to / from Oz.https://centreforaviation.com/analysis/reports/and-then-there-was-one-virgin-atlantics-withdrawal-leaves-ba-as-only-european-airline-in-australia-151240. Many are happy to fly to BKK/HKG/SIN/KUL and then leave it to others for the onward journey. It’s very much taking on the hub and spoke model. Airlines create JV’s and increase market share through mutual agreed operating contracts. Look at LH Group and SQ. Probably the largest JV out there at the moment. Use any combination if codeshares, plus combine LH Group fares to go one way and come back another. They’re even currently selling Y+ fares for under $2500 to Europe. might not be profitable but it’s a traveller’s market these days. Airlines have to adapt to that. I would have expected more from the Germans than to install antiquated 2-2-2 config. It must be a little uncomfortable to be sitting beside a stranger and have your feet almost touch in bed mode. Pass. Comment on "The best business class seats on Lufthansa's Boeing 747-8s"